While flooding the banking system with excessive amounts of fiat dollars, Fed Chairman Bernanke has talked endlessly about the need to avert deflation. Unspoken was the real reason: promoting inflation – robbing retirees and working people who are saving to support their retirements – in order to fund mounting federal debt. It’s now clear that government stimulus spending, under George W. Bush and Barack Obama, and unending expansion of the money supply by the Fed, have prolonged our agonizingly slow economic revival. That is hardly surprising, since no previous resort to Keynesian macroeconomics has worked as advertised. At most they have promoted stock market bubbles, and all such essays, beginning in the 1930s Depression, have led to continual and ruinous inflation. The New York Times, the nation’s premier voice of socialist propaganda, admits in a front page, lead article that Stimulus by Fed Is Disappointing, Economists Say. The Federal Reserve’s experimental effort to spur a recovery by purchasing vast quantities of federal debt has pumped up the stock market, reduced the cost of American exports and allowed companies to borrow money at lower interest rates. The Times may be correct that “most Americans are not feeling the difference,” but we will suffer the consequences increasingly over the next year or so. The price of gasoline is a prominent harbinger. As noted in The Price We Must Pay and The Weak Dollar Problem, the biggest factor in the oil price jump to around $110 per barrel is the Fed-induced devaluation of the dollar. That, by any other name, is inflation. A subtext to deliberate inflation, which President Obama obviously doesn’t wish to publicize, is that it destroys incentives to save. In Keynesian dogma, saving is a social sin, on the false assumption that saving for future needs and future growth subtracts from consumer spending. Keynesians, of course, neglect to note that savings are placed in financial institutions that then lend and invest those funds to power economic growth. The real aim of deliberate inflation is debilitating private business and individual consumers to such an extent that they are forced into becoming wards of the collectivized, socialist political state. New Deal economists, led by Harvard’s Alvin Hansen, propounded the Keynesian doctrine that capitalism had failed, and government would henceforth be required to take over employment and economic investment. President Obama, former House Speaker Nancy Pelosi, and Senate Majority Leader Harry Reid made it abundantly clear that they aimed to create a New New Deal to finish FDR’s start at destruction of private enterprise and individual initiative. 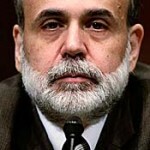 Fed chairman Ben Bernanke, a worshipper of the secular religion of socialism and its Keynesian economic dogma, has happily supported their efforts. This article was originally published in The View From 1776 blog. Why Are Gasoline Prices Rising Again?